Ming consort tomb #2 is mostly absorbed by the outskirts of a small village. 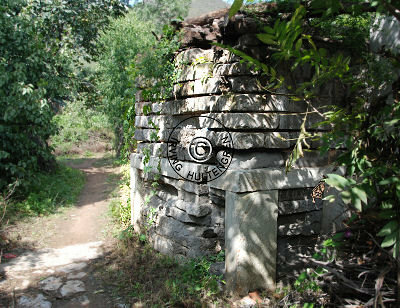 The same village borders tomb #1. 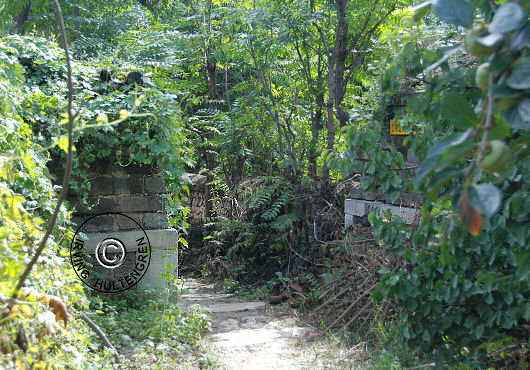 Access to tomb #2 is only through small, unpaved paths and the actual entrance is well concealed between small farmhouses. This mausoleum only has one section. A perimeter wall encloses the entire mausoleum. The rear wall forms a perfect semi-circle. The infamous irrigation canal, which runs the length of the entire mountain ridge does not traverse this consort tomb. The single entrance is still extant, but the wooden tomb doors have long since perished. Just behind the entrance are the ruins of a tall screen wall, whereas the traditional stele is completely absent; not even a trace of the base is to be found. Remnants of five tomb mounds are extant inside the mausoleum; three across in the rear and two in the front. There are no signs of ceremonial halls, not even a single plinth. 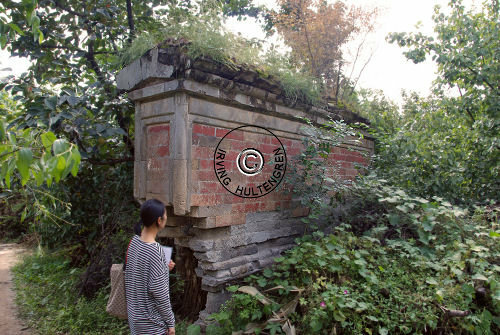 Local people name this tomb "Wuzi" -or "five sons"- owed to the fact that five sons of a Ming emperor are buried here. Allegedly, also several concubines are entombed in this mausoleum, but, if so, then there are no traces of where they were actually interred. That raises the question of whether this really should be classified as a consort mausoleum? The construction of the entrance is similar to those still extant in the other Shisanling concubine tombs. 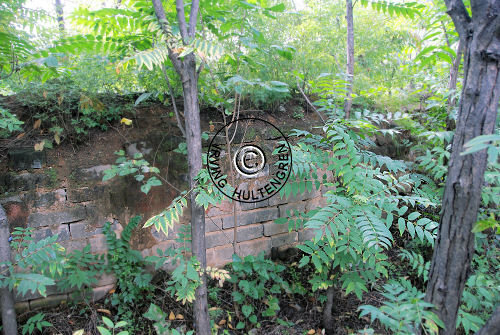 An over two meter tall doorpost made of brick on each side still remains and clearly demarcate the entrance. There are no remnants of the original wooden doors. The entrance appears lower than its counterparts in other concubine tombs. The crossbar -if ever there was one- no longer exists. This is the only concubine tomb with a screen wall right inside the main entrance. Concubine tomb #5 has a screen wall, but in front of the stele in the burial section and not at the front gate. The wall lies only a few meters from the entrance and hence would, as intended, have made it impossible for prying eyes to see any of the contents of the mausoleum through the crack between the doors. Moreover, it was believed that the wall prevented evil spirits from entering, as they allegedly only traveled in straight lines. The screen wall is almost five meters tall. The customary decorative tiles on the screen wall are absent, and were most likely never there. The wall consists of many different types of layers but the large front- and back surfaces consist of red painted brick, a somewhat unusual design for a Ming mausoleum. Some 15-20 meters behind the entrance are two of the five tomb mounds. 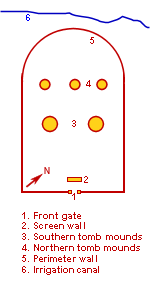 They are in line across with each other and each one is located some 5 meters from its nearest perimeter wall. 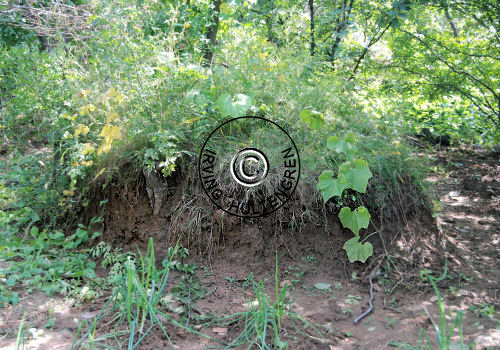 These two mounds are better preserved than their three "brothers" and still rise to some two meters. Another 10 meters deeper into the mausoleum are the remaining three tomb mounds. Also these are in line across with each other and have the same distance between each other and the nearest perimeter wall in complete symmetry. The center one is almost two meters tall, but its siblings east and west are but little over one meter tall. The latter (northern) three mounds are quite dilapidated and are only about 1.5 meters tall. The mausoleum is quiet and serene.The area inside the perimeter walls contains persimmon orchards and the local farmers also grow dade, onions, cabbage, pumpkins etc. The farming area is well attended to and shows signs of respect for the deceased. The entire mausoleum is relatively small and lies secluded from any sort of traffic. The quietness is only interrupted by birds and rustling of the leaves from the orchard trees. The perimeter wall is simpler than that of the other concubine tombs. Large bricks form the entire wall from bottom to top without any decorative layers. The wall was however originally covered with a Vermillion colored plaster on both sides as was customary. Decorative bricks topped the walls and they were covered again with glazed tiles, presumably black or green, but none could be found. A small gap filled in with rocks in the eastern wall shows that someone made a side entrance at some point in time. An earthen "bridge" leads up to the top of the back wall from inside the tomb area allowing one to scale the wall. A small, local footpath leads from the top of the wall to some nearby farming houses.